EMC’s software division has a sales cycle of several months from initial contact to closing the deal. During that time, prospects are nurtured with a series of email contacts which include newsletters and invitations to online events. These emails are sent only to recipients who have opted in via a web registration form, which collects highly granular information about their interests. 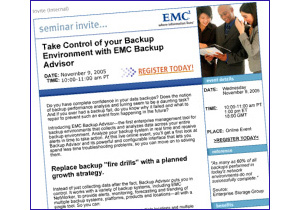 This webinar invitation is an example of many produced by Beasley Direct for EMC. Rather than selling the product itself (in this case, a system backup management tool), it “sells” the benefit of investing 40 minutes in attending the online event. Typically, the registrant to an event like this will receive a “thank you” email which offers a related White Paper to continue the nurturing process.